Find it Only at Lehman's! Long revered as the best butter churn design available, Lehman's has brought the Dazey churn back after a long hiatus. Glass Dazey butter churns are the original, since 1906. Now improved so only easily cleaned glass and sanitary stainless steel touch your cream. Original Dazey churns are available only from Lehman's. Makes butter in as little as 15 minutes! LEARN MORE: Click here to read more from Galen Lehman about redesigning our butter churn. Our Lehman's Dazey Butter Churn is OUT OF STOCK, but we have ordered more! You are still able to purchase it now and we will ship it to you as soon as it arrives. Questions? Please call 1-800-438-5346 or email us at info@Lehmans.com. Antique Dazey Churns are worth thousands. Now you can own a new one that works better and is more sanitary. "Anytime you put effort into growing or making your own food, it will be fresher. Plus, you have the benefit of getting some exercise in the process." I recently invested in the Lehman's Dazey Churn and thoroughly love it even with the draw backs. It makes butter very quickly and in large enough batches to suit my needs. I found the churn very easy to clean and maintain. The only drawbacks I see with this churn is the jar and paddle. I would like to see the paddle about an inch longer to take advantage of the taller jar. The depth of the paddle is perfect but cream in the thick whipped stage sticks to the upper corners of the jar and a longer paddle might help this. The jar design is based on antique glass which was very fragile. The jar could be thinner with modern glass and the upper shoulders slightly more rounded to take advantage of the paddle design. Overall I am very glad someone (Lehman's) took it upon themselves to recreate the Lazey Butter Churn. Well worth the investment. My husband bought this for me for Christmas last year and I used it several times and have these suggestions to improve it. 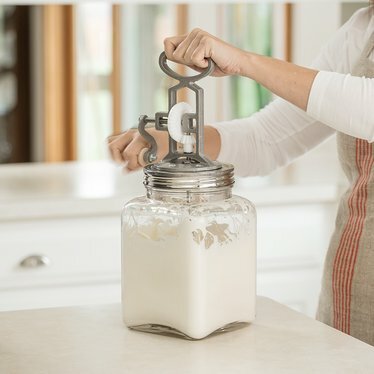 For one, once the butter separates, it's very hard to get it out without making a mess, and that goes for the buttermilk, too. A drain in the bottom for the buttermilk would be a great addition. Also, the top kept loosening up as I worked the paddle and I had to keep tightening it over and over again. The square design of the top also contributes to the difficulty of removing the end products. 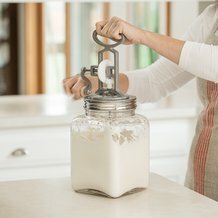 I love the idea but haven't made butter for awhile due to the mess this churn makes. Any chance of future improvements? I have made butter before with a bread machine but the machine broke down after years of use. I wanted something that didn't use electric and I bought this. I have made butter with it and loved it. Wasn't hard at all. I'm glad I got the larger one. It makes a good amount of butter. I want the old version you made. I bought this one in febuary and it has broke 3 times customer CUSTOMER SERVICE IS WONDERFUL! they have sent parts and a replacement but it just keeps breaking, the pin break and gears wear, friend has the old one now for 15 years and no problems. I really need a butter churn that will not break, bring back the old please, waiting on parts to fix again. sometimes new is not always better. We have had this churn and used it now for about 15 years, it has made allot of fresh butter. I recently took the paddle and shaft from an old Dazey that was worn out and put it in this churn, it now makes butter in less than 15 minutes. All I needed to do was drill the shaft to fit the new churn gear location.